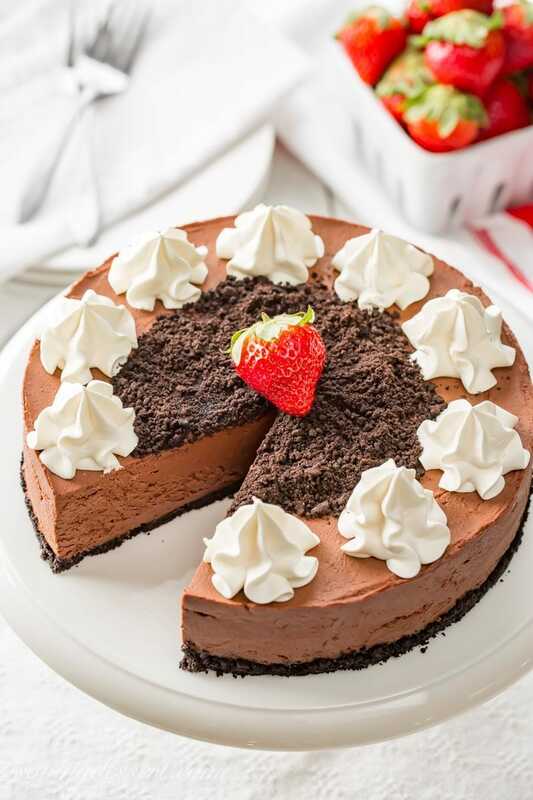 No-Bake Baileys Chocolate Cheesecake with a chocolate cookie crust – this recipe couldn’t be easier! This recipe first appeared on RecipeGirl where I’m a contributor and occasionally post delicious desserts! I love the tanginess from the cream cheese in this Baileys Cheesecake and its’ great silky texture. There is a subtle richness and the intense chocolate flavor adds a luxurious flair to this no-bake dessert. Baileys Irish Cream is a super popular liqueur made from Irish whiskey, coffee and cream, so you know it marries perfectly with chocolate! You don’t have to use the Baileys brand liqueur, any Irish cream will do. After testing this recipe a few times, we found that 1/4 cup of Baileys is just about right. Don’t get carried away and add more Irish cream, and don’t skip the vanilla; it really balances the flavors perfectly. Due to the high chocolate content, there’s no need for gelatin to ensure it sets up perfectly. 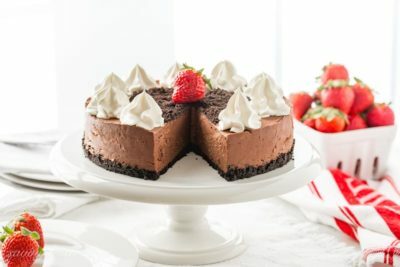 The cheesecake portion of this recipe is made with only 6 ingredients so it’s extra important to use the best quality chocolate you can find. Chocolate chips won’t work well in this cheesecake and may seize up. We tested with bittersweet and semi-sweet chocolate and without a doubt, prefer the semi-sweet. Cream cheese has a lovely texture already, but when you add in lots of melted cooled chocolate the consistency becomes a little thicker but still melt-in-your-mouth velvety smooth. I recommend cutting this cheesecake when very cold. For pretty slices, warm the knife under hot water and dry before cutting each piece. This 8-inch no-bake Irish cream cheesecake will easily serve 10-12 so be sure to cut the pieces small. Our Baileys cheesecake is not overly sweet; it has just the right amount of chocolate flavor and melts in your mouth like butter! Our no-bake cheesecake is best served with fresh strawberries or raspberries and a dollop of lightly sweetened whipped cream. The tartness of the fruit pairs perfectly with the creamy chocolate cheesecake and in my humble opinion, adds to the whole experience. The crust was made with Nabisco Famous Cookie Wafers but feel free to use homemade cookies or another brand. I would not make it with anything too sweet – you just don’t need it! This easy-peasy no-bake Baileys Chocolate Cheesecake keeps for up to a week when refrigerated. It’s best cut when cold then allowed to sit at room temperature for 15-30 minutes before serving. 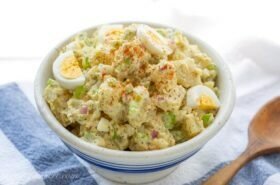 This is a terrific ending to a nice dinner party, or for your next St. Patrick’s Day extravaganza! The Irish love cheesecake too! 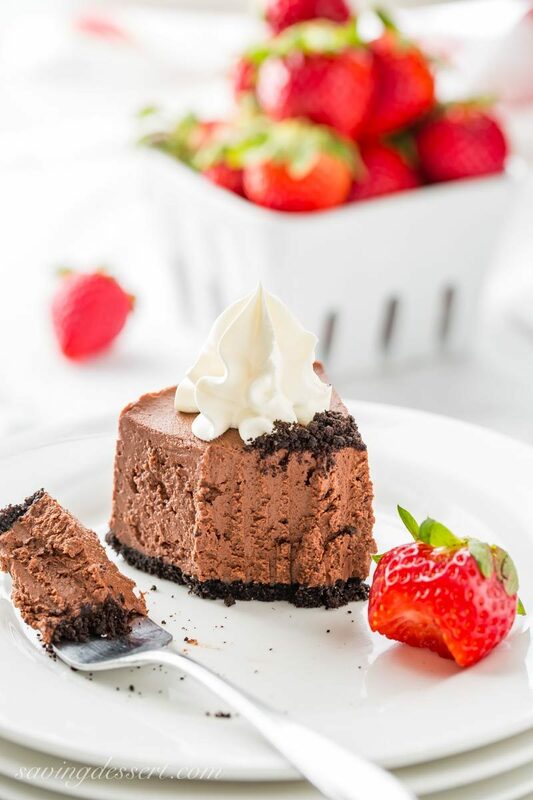 With a chocolate cookie crust, great silky texture, subtle richness and the intense chocolate flavor that adds a luxurious flair to this no-bake dessert. Turn the base of an 8-inch springform pan upside down to make it easier to remove the cheesecake later. Line the bottom with parchment paper and secure the sides. Lightly grease the sides of the pan with butter. Set aside. Place the chocolate wafer cookies into the bowl of a food processor. Pulse until cookies to a fine crumb. Add the butter and sugar and pulse again until combined. Spread the cookie mixture in the bottom of the prepared pan. Press down firmly (especially at the outside edges of the pan, and refrigerate for 1 hour. While the crust is chilling, place the chocolate in a heat-proof bowl set over a pan of hot (not boiling) water. Heat until melted, stirring occasionally. Remove the bowl of chocolate from the simmering saucepan and set aside to cool. Using an electric mixer and a medium clean mixing bowl, beat the whipping cream until soft peaks form. Using the same electric mixer, combine the granulated sugar and cream cheese in a large mixing bowl. Beat until combined and smooth. Add the cooled chocolate and mix until blended. The mixture will harden a little, but keep mixing until combined. Add the whipped cream to the chocolate cream cheese mixture and blend on low speed. Add the Irish cream and vanilla and blend on low until incorporated. Scrape down the sides of the bowl and blend another few seconds. Spoon the cheesecake mixture into the cake pan and smooth the top, an off-set spatula works best here. Lightly cover top with plastic wrap and chill until firm, at least 2 hours or overnight. 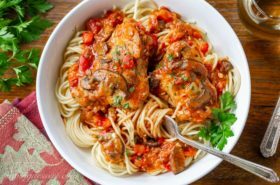 To serve, remove the sides of the pan and gently transfer to a serving plate. Cut into slices using a warm, dry knife. Serve immediately garnished with sweetened whipped cream and strawberries if desired. DO NOT use chocolate chips for this recipe. They do not melt the same as good quality chocolate and may seize up when adding the cream cheese and Bailey's. If you purchase something from Amazon after following my affiliate link, I receive a small commission, at no additional cost to you, which I use to pay for web hosting and services for this blog. Thanks for helping support SRFD! No doubt you’ve seen a lot of Irish Cream recipes lately with St. Patrick’s Day on the radar. There’s good reason they’re so popular! Irish Cream makes everything wonderful – even ice 🙂 Our Bailey’s Chocolate Mousse is an easy must try recipe if you love this chocolate Irish cream combo. For another deliciously easy dessert, try these Chocolate Soufflé with Bailey’s Creme Anglaise too. We also love these Bailey’s Irish Cream Chocolate Truffles too – so easy and terrific! Maybe you’d like to try making your own Homemade Irish Cream like this recipe from The View from Great Island. This looks so decadent, I can’t wait to make it. You mentioned it’s an 8 inch, but the link for the springform pan is 9 inch. Will that make a big difference? Hi Paula – that’s a great question and my mistake on the Amazon link. However, since this is a no-bake dessert, the size of the pan won’t make a bit of difference. You could even make it in an 8 or 9-inch square pan but you can’t remove the sides. 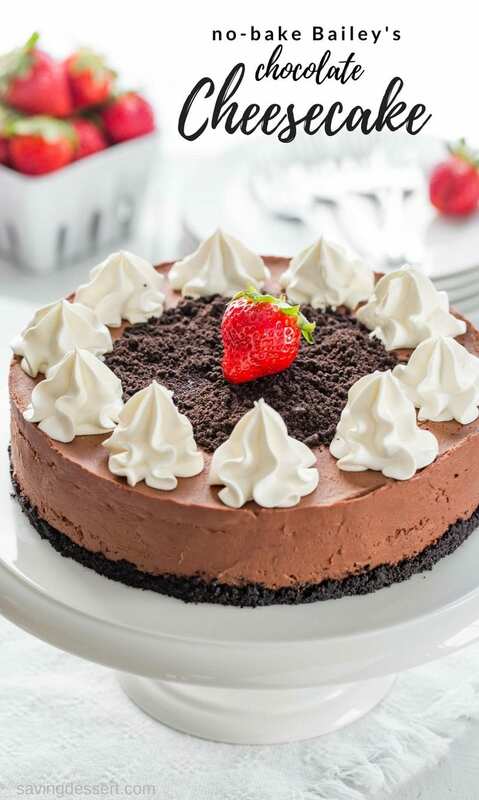 I hope you enjoy this rich and chocolaty cheesecake. It has a unique flavor which we all love. Any springform pan will do! Thanks so much. No bake? Sold! Such a terrific recipe — loaded with flavor, and so pretty! Great pictures, too. Definitely a winner — thanks. What a lovely cheesecake, Tricia! What I wouldn’t do for a slice of this sitting in front of me right now. I can almost taste it! It really melts in your mouth Susan – thank you! Such a gorgeous cheesecake! I’m pinning as it won’t be long until I’m without a kitchen…sniff, sniff. This dessert will certainly lift our spirits! Pinning!!! We renovated our kitchen last year – and it took forever! So glad you have a good contractor! Can’t wait to see the photos 🙂 Thanks for pinning Liz! Woo hoo, Tricia! This is one sinfully smooth creamy delicious dessert! Bailey’s and chocolate, what’s not to like, and no-bake makes it perfect. I bet you thrilled everyone with a serving of this!!! Have a wonderful rest of the week! Aww thanks Pam – you too! 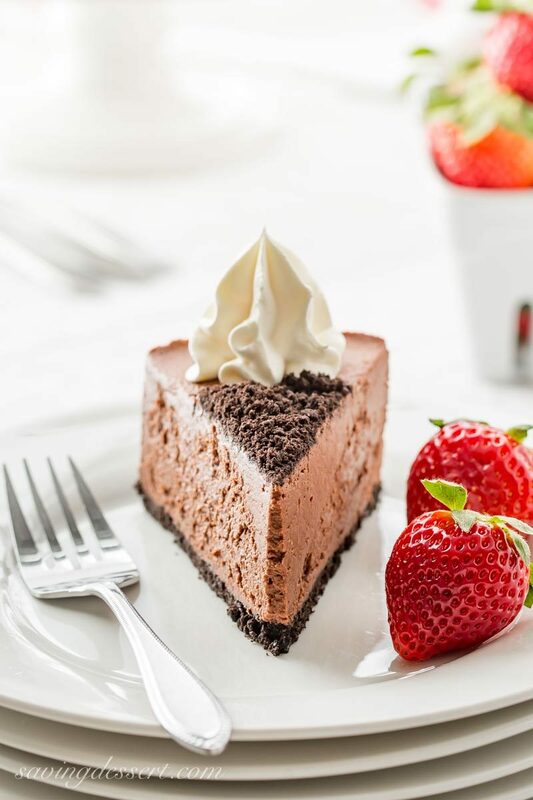 Chocolate Cheesecake is one of my favorites and this one looks amazing. And easy. Yum. 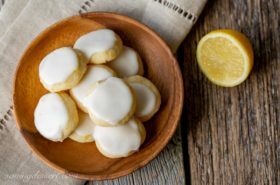 So easy and delicious – absolutely dangerous in our house! Tricia..Jacques’ bday is Sat and I offered to bring dessert..I had bought the Bailey’s for a cheesecake..a baked one..but now I am rething! I think I will do yours as it looks perfect! What timing! 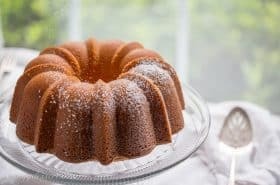 This is so easy to make Monique – and is certainly for the chocolate lover in your house (Jacques). It will feed a small crowd so this may be perfect for your celebration 🙂 Hope you love it as much as we do! Your cake looks fantastic Tricia, I would love to make it but I am leaving for Germany in a week. Pinned for later ! Have a wonderful trip Gerlinde – can’t wait to see your photos! That is some impressive cheesecake, great job. 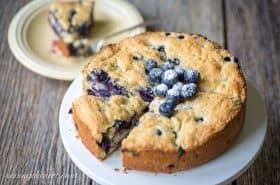 This looks so decadently delicious and like it would just melt in your mouth with every heavenly bite! It really does melt in your mouth Chris! This would be perfect to share with your family! Yikes, I can really see the dense chocolatey texture in your photos, what a show stopper! It disappears quickly Sue – just be sure to have friends to share it with! This is a very rich dessert Monica – so a small slice is perfect. But that doesn’t mean you can’t have several small slices each day – haha – breakfast, lunch and dinner – and a midnight snack! Beautiful! And I’m all about the cheesecake these days, since my first visit to the Cheesecake Factory. It reminded me that I need to eat more cheesecake 🙂 Love this one and no-bake is always good! This is a pure delight, Tricia. The dark chocolate crust and dense cheesecake flavoured with baileys…just sensational! Thanks Angie – everybody loves Bailey’s and chocolate together and this is so easy to make. Have a terrific week!